MATT COMPANY was founded in the late 80s., as a continuation of the Warehouse Jaga / first private warehouse in Pomerania /. Thanks to the experience of the owners it successfully managed to take such a course of development that led to create his own line of professional cosmetics FLASH COLLECTION. Our experience supported by special education guarantees high quality and attractiveness of our products. Introduced new fully keep pace with global design and fashion. Many products have an innovative character. Our products are made primarily in Poland, compared with an Asian winning product not only high quality but also affordable price. This products are dedicated mainly to professionals but also amateurs. Our offer is probably unrivaled not only in Poland. All products have certificates required by the EU. 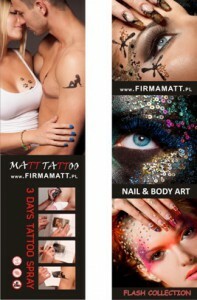 Recently with the help of funds from the European Union there was launched a COMPANY MATT based on the Internet. It is the originator and executor of the project website firmamatt.pl systemizing cosmetic industries, hairdressing, fitness and related services.